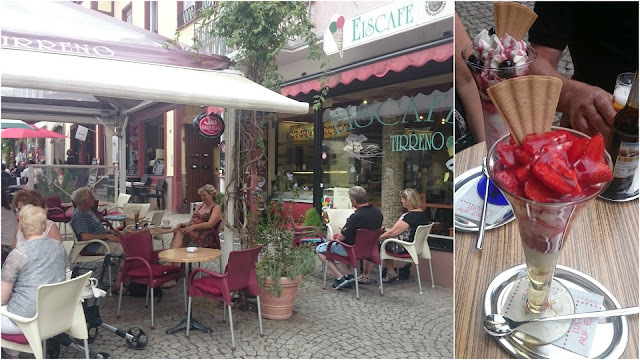 Rüdesheim is like my second home in the summer, so i have tried close to all restaurants around town and of course i have some favorites. Some of them have the most amazing food and some have the friendelist staff. I' tell you about my favorites of both. This place can be hard to find. It is a little opening, kind of like a garage door, but there is kind of an alley that leads to an outdoor restaurant. It has a roof, so you can sit outside, even though the weater is bad and they have heaters too it needed. The reason why i love this place is the owner. An nice old japanese guy who happen to be really good at making classic german food. One of the first years we were there he was going around chased flies. We though it was a bit odd, so we asked him why. A bird had a nest in the corner of the alley entrance and has left it because of the many people there. So i was feeding the chicks flies, so they world survive. The year after we went in there to ask how it ended with the birds and two acutally survived. Another thing is, that we kind of have a fun competition going on with the owner. We always order the same in there, schnitzel with mushroom sauce (schnitzel jäger art) because it is the best snitzel in Rüdesheim! The first few times we were there i was a little girl with quite an appetite and he was impressed with how much i could eat. So if i could eat the schnitzel i made, i would get a free icecream. Year after year the schnitzels and getting bigger and bigger and this year was not an exception. But the fun part was that all of us eat it all except my dad. So we all got free icecream except him. It was so funny! As you see.. i got the biggest schnitzel. To me vacation+Germany= Eiscafes. I really love eiscafes and i wish other countries would do this as much as Germany because it is so cozy! Eiscafe Tirreno is an Italian eiscafe that makes all the ice by themselves. It is really good and they are so fast in making the most awesome desserts like the one on my picture. It is a "Erdbeerbecher" Strawberry cup with freash strawberries and vanilla ice. My mom got a cherry one. They have so many different kinds of icecreams and desserts. When you get a table, you will have four different menu card. A fun thing they have that i really recommend is their "spaghetti icecream" It is simply icecream that looks like spaghetti with sauce with cream in the middle. If you want a "going-out" icecream they also have desserts with alcohol in them. Okay let's be honest. Most people today is drawn by the "free WIFI" sign. I was too. I have been walking by this baker so many times when i was younger. Only looking inside at the food and cakes and think "wooow" but then kept walking. It was until i got a smartphone. I was in need of internet and i didn't want to use the internetcafe in the town, so i told my parents about this place and we have come there many times since. It is a baker but at the same time a cafe. They have a killer breakfast menu with scramble eggs and all that but if you ask me, the girl with the heart made of sweets, i came there for their cakes. The one in the picture is a strawberry cake and it was so heavy that you don't need to eat for a long time, after eating this. It was so good! Also, im a bit of a tea snob and the germans are not tea people. I get ticks when i go into a cafe and i ask for tea and they only askes "Black or green?" There is so much more to tea than that. So when i came into this bakery and asked for tea, they had a whole list of different black teas and green teas. That is heaven for me right there! Im sorry to say, but i forgot to take pictures from this restaurant. But let's just say that when you automaticlly log in on their WIFI, you are there too often. This is an Italian restaurant and it is really one of the best i have even been on. Maybe because i haven't been to Italy yet? I can't say. Their menu is really rich and there is so much to choose from. I have never got the same two times while i have been there. They, of course, specializes in pasta in so many different ways that it is human possible. Their pizzas are phenomenal even though they are so simple. The waiters there are really sweet and they don't mock you if you can't pronounce one of the many Italian names for the food. This is by fare both my mom and dads favorite and i should say from my dad, that i should recommend the spaghetti carbonates.